Beneath the Cross | Redeemed! 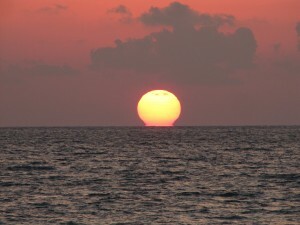 We vacationed, last week, at Anna Maria Island, Florida. Although stormy weather prevented some of the activities we had planned, we still had an amazing vacation, and enjoyed some beautiful sunsets and moonsets! 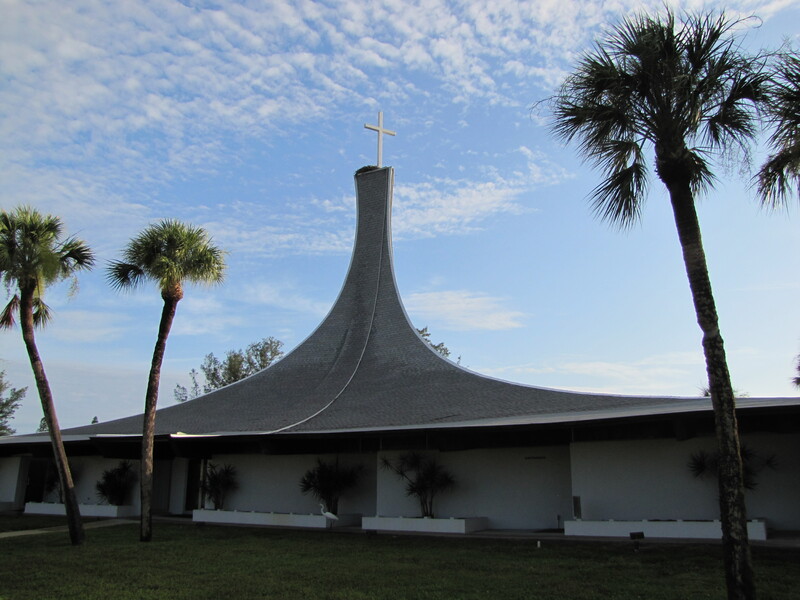 Several times we passed Gloria Dei Lutheran Church, located on one of the more prominent streets. The sweeping roof line caught my eye, the first time we passed. As my eye traveled up the sweep of the roof to the peak, I noticed the osprey nest sitting at the foot of the cross, with two osprey peering over the side. At the moment, I was driving on a busy street, unprepared to stop. Later, when I returned for pictures, the osprey were not home. Osprey nest near water and primarily dine on fish. Although distinctly different from hawks and eagles, they are sometimes referred to as sea hawks or fish eagles. Osprey almost always mate for life. Although migratory birds, osprey generally return, each year, to the same nest to repair and expand their home. Osprey nest on the highest available platform of suitable size. Young osprey may delay mating for several years due to an insufficient supply of suitably tall structures. 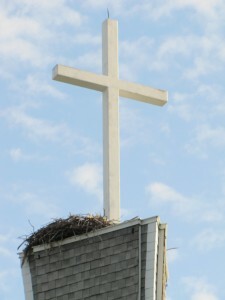 One of the tallest suitable locations for osprey nesting, on this island, is at the foot of this cross. May I ever make my home at the foot of the cross…both the humblest and the most exalted position in all humanity. This entry was posted in Animal Stories, Faith, Redemption and tagged christian, cross, faith, gospel, humility, nest, osprey, perspective, wings by joe. Bookmark the permalink.